There's a strong indication that Alabama quarterback ​Jalen Hurts will transfer from the Crimson Tide this offseason. According to Barton Simmons of CBS Sports, Jalen Hurts is reportedly in the transfer portal. From a source: Jalen Hurts' name is now in the transfer portal. The news should come as no surprise, as Hurts lost his starting job to Heisman runner-up ​Tua Tagovailoa in last year's National Championship Game. The junior served as Alabama's starter in his first two years in Tuscaloosa, throwing for 4,861 yards, 40 touchdowns and 10 interceptions and adding 1,809 yards and 21 touchdowns in the run game. Hurts helped lead the Crimson Tide to a National Championship appearance as a freshman, eventually losing to Clemson and Deshaun Watson. He lost his starting spot to to Tagovailoa in the second half of last year's national title game after a 13-0 halftime deficit. Tua then sparked a comeback victory for the Tide. 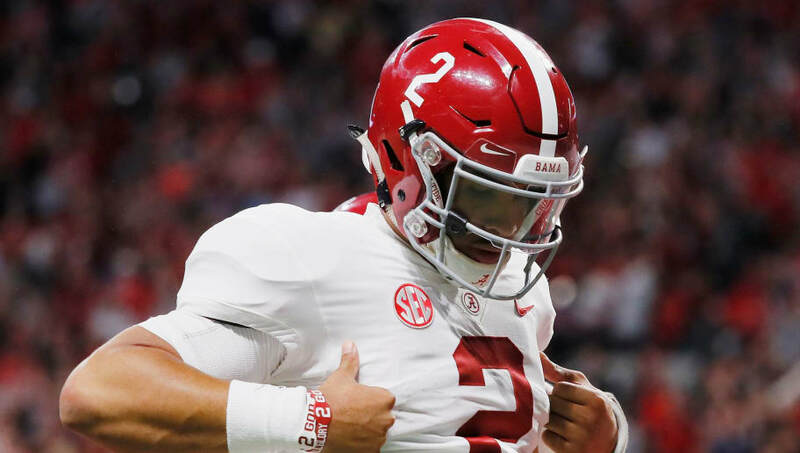 But Hurts played the hero for what may very well have been his final shining moment for the Crimson Tide when he entered the fourth quarter of the SEC Championship Game after Tagovailoa was forced out with an injury. Hurts led two touchdown drives and earned the SEC title to send the team back to the College Football Playoff. The choice was simple for Hurts this coming season, and we'll be awaiting speculation in terms of where he lands.